NCAA Division 1 men’s college ice hockey teams are small, around 20 players in total. The typical number of skaters on the ice at any one moment is 12, six on each side. Each player has a position, a role, but when they go into action, skating as fast as they can with their eyes on the puck, one another, and the goal all at once, it’s hard to tell who’s doing what. Team movement mesmerizes: The puck flies; a stick catches it and splits in two; its owner whirls backward; players streak across the ice and crash into one another; the fans scream, “Skate! Shoot!” We are glad none is our child. It’s such an exhausting sport that every 60 seconds or so, all the skaters head for their respective benches to rest as fresh replacements climb over the boards and on to the ice. The speed of the whole operation is dizzying, with teams and sub-teams forming and reforming, depending on the task at hand. Coaches keep the process moving: They call players, suggest plays, draw configurations on pieces of paper that players crowd around to see. In crunch-time, they abandon typical rules. The number of people on the ice unbalances from one side to the other. In their first face-off of the 21st century, Yale is down 1 on Harvard’s ice (home teams usually have an advantage). Coach Tim Taylor pulls his goalie in the last two minutes (the deadline), replacing him with an additional forward. That gives Yale six offensive players against Harvard’s five. It is an all-out drive to reach the goal(ie) and the team needs all-hands on. Such is life in virtual teams. Small numbers, constantly shifting. Some people go all out while others rest, then just as quickly they switch positions. Operating with commonly agreed protocols, virtual teams invent new ones in the crunch. All-hands means everyone is “on the ice,” a requirement for keeping up in Internet time. Everyone focuses on the same goal, each has a role, and when the team is in high action, leadership moves from person to person. You’re at the center now, then on the sides while someone else leads. The team leader or coach or maybe both keep an eye on the whole, making sure everyone is playing, participating. Every move is a play; learning to play is the key. With its acquisition of Warner-Lambert, Pfizer is the world’s second largest pharmaceutical company. Today McKinnell is talking about bandwidth. He is excited about the company’s videoconferencing system that links the 5000-person sales force at real-time speed. The future is a monumental challenge for companies like Pfizer. Each day of its final drug development process costs $1 million in direct expenses. Use multiples to calculate the lost market opportunity for each of those days. At the same time, the company is expanding the number of compounds it develops simultaneously, while integrating one of its competitors. The company’s people epitomize specialized knowledge workers. They practice science and produce ideas in a rigorous sequence that involves industry, government, and consumers. Anything, everything that speeds up processes while maintaining quality is to Pfizer’s advantage. Pfizer brings its global product development teams together to launch them, then sends them off to carry out their plans virtually. “We have a large catalytic event that gets people face-to-face for a period of time to build trust and personal connection. We develop shared aspirations, clarity of purpose, goals, and an action plan,” Bonito says. Then the teams return to their home locations, usually involving people to carry out the plan. Pfizer’s Central Research organization is experimenting with a combination of face-to-face meetings and up-to-the-minute virtual team rooms. "Teams are just such complex things, and virtual, cross functional teams are several orders of magnitude more complex," says Jim McCarthy, senior advisor in its Team Effectiveness group that supports the company's research and development teams. He cautions: "You really do need to do your homework if you are going to bring teams online. Your job is to diffuse complexity. It is a very different process and part of the battle is having people understand that there is value in doing work differently. People tend to see things online and believe they have to interact with everything. You just need to think of web-based team processes as a set of just-in-time tools; use only what you need, when you need it." Hank McKinnell is a laptop-carrying executive, a good role model for the company. He’s a Ph.D. chemical engineer who in his college days programmed an IBM 1401 in machine language. “I moved the wires around in the back of the machine,” he remembers. Pfizer is the first pharmaceutical company to put its annual report on the Internet in 1994.2 The experiences that have helped McKinnell most in his career? Learning to type in high school and spending half his work life outside the U.S. The National Museum of American History in Washington, D.C., houses an exhibit heralding the start of the Information Revolution. A female mannequin stands in a 19th-century office, while a male wax figure in a Victorian business suit watches her. She literally is cutting the red tape that binds brown-accordion folders stuffed with papers. On this day, the organization of information makes its next big move—into the newly invented wooden filing cabinet. On a steamy end-of-August dog day in August 1993, most people in the capital have left for vacation. Yet across the street from the museum, the vestibule of the Mellon Auditorium, with its three-story-tall marble columns and oak floors so old that they can no longer be sanded, is crowded and noisy with 200 people. They are registering for a conference. Its purpose? To launch a network of federal employees who participated in the first stage of “reinventing government.” We are there as designers and facilitators of the three-day, getting-started process. Reinvent the U.S. government? Isn’t this the proverbial oxymoron? Even if you could, skeptics say, would you want to? All this governmental introspection is easy to understand. Like most other centuries’-old organizations, the U.S. government no longer can cope with its problems in the same way it has in the past. The 21st century is about speed and information, knowledge and competence, complexity and wisdom. The 19th century was about slow, steady progress, factories and railroads, clockworks and mechanisms. Industrial Age organizations ill serve the turmoil of the Age of the Network. Marion Metcalf is one of the original 200 “crusading federal bureaucrats” who staff the government’s 1993 National Performance Review. A graduate of Brown University and with a master’s in city and regional planning from Harvard, she joins from the Justice Department where she’s worked for a number of years. NPR has an exceptionally cross-boundary design for a government initiative. The “volunteers” from 22 major agencies seconde to NPR for five months forming 33 cross-functional teams, including 11 “systems” teams that look at department-spanning issues like finance and organizational design. Their mandate is to come up with a plan for reinvention. The rule for the agency teams is that people cannot “reinvent” their own departments. Metcalf, for example, whose day job is in the Enforcement Office at the Immigration and Naturalization Service, serves on the Department of Labor team. For the systems teams, “NPR recruited recognized reformers (by networking to find out who they were! ),” Metcalf explains,5 mentioning Vincette Goerl, then a financial manager at the General Services Administration (now chief financial officer at the U.S. Forest Service) who works on the Financial Management Team. The beauty of this design is that it depends on the real experts—the people who, on a daily basis, grind out the federal government. No one knows better than they the pain of securing 23 signatures for a simple travel voucher or the labor-intensive paper-pushing process that could take up to three years to buy a PC. Many generations of PCs develop, grow, and die in that time. NPR invites numerous management consultants to address the staff at brown bag lunches and keynotes. Tom Peters kicks off the Labor Department’s reinvention effort with a packed house of 1,500 at the Mellon Auditorium. Joseph Juran, Peter Senge, Daryl Connor, and Shoshanna Zuboff, to name just a few, along with executives from many companies coping with complex change, get their 15 minutes, many in front of then-Vice President Al Gore, who sponsors the reinvention campaign. We get involved because Metcalf has a sore throat. Our third book on the development of networked organizations, The TeamNet Factor, is still in galleys when Seattle-based Robert Gilman, publisher of In Context6, reads it on a flight to Washington. When he arrives, he calls Al Gilman (his brother and Marion’s husband), who is at choral practice7, which Marion has skipped due to her sore throat. So Marion and Robert start talking, and she explains her new assignment working for the vice president. The toughest problem, she says, is getting agencies and internal departments to work together across boundaries. Robert tells her about our book, and soon we too are volunteering at NPR in Summer 1993. People are wondering what will happen when they return to their home agencies. Their experience has turned them into evangelists. How can they go back to, in many cases, their dreary, paper-pushing, meeting-infested, low-results jobs? Can’t they stay connected in some way, continuing to exchange ideas while actively working to implement the recommendations? Stone’s nod of the head gives the go-ahead to launch a people network that will link the returning army of reinventing-government believers. “There’s no way to tell how much good you’re doing in such an effort,” says Bob Stone, who retires as “Energizer in Chief” of NPR in 1999. The “net result” is most evident, he believes, in the networks and networking spawned by the people who participate: Financial and procurement executives from across government remain tightly linked12; information reaches places the same day that formerly took months to arrive; and people like Metcalf receive awards for encouraging greater cooperation. Marion Metcalf receives a standing ovation from a packed Riverside Baptist Church in Washington, D.C. on December 17th, 1999. Her family, friends, and colleagues are celebrating Metcalf’s life, including her awards just the month before from the U.S. Immigration and Naturalization Service Commissioner and Government Technology Leadership Award. She is the team leader for INS’s Green Card team that overhauls how the agency’s lead product is produced. When Metcalf takes over the project, “INS had only one facility producing the [green] cards, and it just couldn't keep up with demand. To make matters worse, INS had created more types of cards over the years. This meant different systems producing the different cards. But INS has put those days behind it,”13 writes Joshua Dean in Gov.Exec.com, which also gives Metcalf’s team an award. Such is her challenge when she arrives. New technology choices cause a stalemate while the old system is so antiquated that no one wants to use it any longer. Typical government silos prevent people with a good solution and a new approach from being able to implement it. There are few dry eyes at Marion Metcalf’s memorial service as her brother Larry repeats this phrase. Metcalf has died suddenly the previous Saturday at age 44. Friends and family come from across the country, including people who know her best online. Metcalf’s NPR experience turns her into a prodigious online networker. Although severe congenital scoliosis prevents her from straightening her limbs, she angles toward the keyboard and types as fast as anyone you’ve ever seen. She helps launch NetResults, posting hundreds of messages, sets up web sites for government, nonprofits, friends, participates regularly in a family listserv, and becomes a guiding voice in SPIRIT, the women’s conference housed on Caucus’s16 online network. Sutton is blind. Such is the power of networking in the Network Age. While it’s not easy to be a member or leader of a team, it’s even more difficult in a virtual team deep in the flux of change. All the self-doubting questions that any team member asks—”What am I doing here? Do they need me? Am I included? Who’s the leader? How aggressive do I need to be? Will I measure up?”—are even more exaggerated when the group lacks daily face-to-face contact. Doubts, concerns, perceived problems, and boredom mingle with excitement, opportunities, caring, satisfaction, and even exhilaration. To be part of a team is to continuously work a dynamic tension deep in the heart of being human. I must simultaneously be “me,” an independent individual, and “we,” an interdependent person in a group. Each of us grapples with this tension between the need to separate or differentiate, to enhance our individuality, and the need to integrate—to bond in groups. Cooperation requires independence. This apparent contradiction is the challenge of working well with other people. Too often the individual and the group post to opposite sides of the wall, each vying to prevail in a win-lose contest. We characterize entire cultures as individualistic (United States) or group-oriented (Japan). In reality, me and we are complements, not opposites. This is the key to resolving the paradox. Virtual teams arc high-connectivity organizations. To a significant degree, virtual teams self-manage. For them to succeed, people must be independent and capable of making quick yet thoughtful decisions. “Virtual” people need to know more, decide more, do more. Clear agreements on purpose coupled with personal commitment comprise one part of the equation; open, accessible, comprehensive information and communication environments are the other. These make possible the ongoing conversation that is the team’s process. To see me and we across the boundaries of a virtual team, adopt the “CEO view,” a fundamental personal and virtual skill. Tom Botts, Natural Gas Director for Shell U.K, is trying to build a cohesive group from three distinct organizational cultures and multiple ethnic ones. “The key is not just getting people to know one another but knitting them together. They need a compelling story that everyone can hold. How and why does this thing fit together?” he asks. Metaphorically, leaders are like Janus, the Roman god of beginnings and endings, who guards doorways. The god of portals has two faces, one that looks in and the other that looks out. The Janus leader views life from the boundary—looking inward to the group itself and outward to the environment. The CEO’s is a natural Janus view. The top-level leader sits on the organization’s boundary, balancing internal needs and capabilities with external assessments and strategies. Internally, the organization is a web of relationships, while externally a web of relationships enmeshes the organization itself. Not only at-the-top leaders, but leaders at every level sit on boundaries. Simultaneously they peer up-and-down and in-and-out. From Janus’s view, people are holons. People are both wholes and parts. Holon means whole (“hol-”) and part (“-on”). As individuals, people are parts of groups; as leaders they stand for the whole. Arthur Koestler originally coined the word holon.6 It concisely expresses the idea that everything (like atoms, cells, solar systems, cars, and people) is simultaneously a whole in and of itself and a part within something larger. Simple word, complex idea. We use the holon (hierarchy) idea every time we use money, outline a report, store a file, find a reference, or check an organization chart. When we “go up a level” to a higher authority, broader scope, or more abstract view, we use the holon idea literally. We also use it when we “go down a level” to more detail, narrower scope, and more concrete views. Strange a word as it is for most people (though The Police used it in an early-1980s song), holon can stand for organizations, small groups, and individuals. 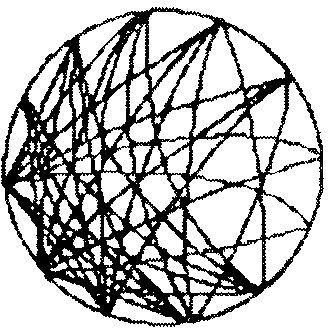 Stripped to its mathematical essence and used in the context of technology, a holon is a “node.” People and virtual teams are nodes in networks. A node may be simple—one person—or it may unfold into a whole universe. America Online is only one node on the Internet but millions of people are attached to it. A team is a node in a larger organization, and it comprises member nodes linked into a network. Members, leaders, and levels resolve the me/we paradox. They turn flesh-and-blood hug-able people into intangible hard-to-grasp virtual teams. The experience of finding oneself on too many teams is not unusual. Most people are members of multiple groups. We all take part in a constantly changing personal pageant of many small groups simultaneously—family, community, friendship, and affinity groups as well as task-oriented work teams. In each group and team, we play different roles. People are not parts of groups the same way that hearts are part of bodies. Only in the extreme (slavery, for instance) does a group own people body and soul. Like people, roles are integral to groups. People animate roles that belong to the group. The role mediates between an independent individual and his or her expected behavior in the group. What sociologist Erving Goffman calls the basic “unit of socialization,” roles naturally arise informally in small groups and are more “felt” than “visible.” In larger organizations, roles tend to take on more trappings through titles, written job descriptions, and personal contracts. Roles translate between me and we, between the bottomless complexity of individual people and the comparative simplicity of playing a part in a group. Roles are easier to see in their more formal presentation as “positions.” People usually diagram positions in relationship to other positions; organization charts show which person reports to whom. Positions clearly belong to the organization that sets them up and can just as easily take them away. An open position—a formal role—stands by itself as a sometimes-gaping hole in an organization, an empty place in the structure. When a person steps into a position, a classic dynamic arises between the characteristics of the particular person and the legacy of expectations that the role conveys. Once populated anew, the role both shapes and is shaped by the person who occupies it (Figure 8.1). This becomes even more complex when the team is virtual. Role flexibility is essential because the process is dynamic and roles change constantly. Respect for the individual is a core value of all the great team companies. The trick is to develop greater cross-boundary capabilities without diminishing—better yet, while enhancing— the independence of individuals and teams. Enhance independence as you strengthen interdependence. Independence permeates every level of organization—from people as members of teams, to teams as parts of larger organizations, to the independence required of companies in alliances. All groups need a minimal level of independence and decision-making in relationship to the larger system. Virtual teams need even more. Because virtual teams need higher levels of interdependence in roles, they require correspondingly higher levels of relative independence and voluntary behavior in the individual members. One leader makes for a good sound bite, but it takes more than one to lead a successful virtual team. Insofar as the sudden proliferation of virtual teams is in some ways a harking back to a simpler way of organizing, it is instructive to look at how the most original teams handled leadership. In forager societies, there are many informal leaders. Among the !Kung tribe in the Kalahari Desert in Botswana, a foraging society that has survived thousands of years in spite of tremendous threat, leaders influence but they do not force. Virtual teams take a page from the !Kung book. As organizations that require much more leadership than conventional co-located teams, they nevertheless have much lower overall coordination cost. This only works if everyone understands and assumes part of the expanded virtual leadership burden. Decades of research on small groups and teams have turned up this major insight: The only universal role observed in groups is leadership. Virtual teams are leader-full not leader-less. The transformation of a person into representing a group by way of leadership is a miracle of social construction. Leaders are convenient handles to help members and outside observers alike grasp groups. When confronted with complex ideas, people have a habit of using one part of the idea to represent the whole. “Wall Street” stands for the complexity of U.S. financial markets; the “Oval Office” stands for the presidency and Executive Branch of government. The phrase, “I belong to Gail’s group,” shows one person representing a whole group, nowhere more obvious than in the role of the CEO. Here, a person stands for a corporate entity that may include thousands of people, “speaking for” the organization externally and “speaking to” the group internally. While virtual teams may have single leaders, multiple leaders are the norm rather than the exception.20 Virtual teams that deal with complex issues and problems invariably have shared leadership regardless of the titles they use for convenience. In the earliest teams, the camp teams, leadership was informal and distributed, based on influence rather than authority. We are in many ways returning to the organic structures of that era, albeit with a fantastic new capability to create non-territorial spaces and share information. •	Social leaders arise from interactions that generate feelings of group identity, status, attractiveness, and personal satisfaction. Group cohesion measures social leadership success and is equally critical to virtual teams sustaining themselves. 	The vice president is a designation of social rank, a level in an authority structure—the hierarchy part of the title. 	Manufacturing is a label of task specialization, pointing to an area of expertise—the bureaucracy part of the title. How do you convey rank online? New interactive media such as e-mail pose unforeseen problems to the existing authority structure. In work areas, for example, space displays importance (a closed office versus a cubicle), signs offer titles, and choice of attire differentiates employees from executives. Rank–having it and using it–is a major challenge for virtual groups. A new team often defines its expertise roles before it locates the members who populate them. This is in itself a step toward virtuality. Imagine a team that does not yet exist. It is most often the search for the “right people,” those with needed expertise and experience, that leads to different locations and organizations—and the consequent formation of a virtual team. While rank is confusing, specialization is booming in virtual teams. Your area of expertise most often defines your role in task-oriented virtual teams. “I can’t think of any project that we do on our own. There is just too much to know and there are too many specialties in the built environment,” says Gary Wheeler who leads the Chicago office of Perkins & Will, the architectural, engineering, and interior design firm, and is past president of the American Society of Interior Design. Wheeler’s office is just completing a project for ADC, the Minneapolis-based broadband company. “We did all the program interviews over their intranet site allowing up to 5,000 people the opportunity to give input. We got 30-40 percent response, where normally we get 10-20 percent. We’re involving people from HR, IT, facilities, and management on the core team. We validated our findings with them then shared them with leadership. A great deal was done via the net.” This is a completely new way to work for a company as grounded in place as an architecture and design firm. Managing the challenges of virtual team life also brings the opportunity to involve the best minds and most experienced people, wherever in the world they may be. In time, great teams will become the norm as we climb the learning curve of distributed work. Big organizations are made up of smaller organizations that are made up of even smaller groups. Small groups tie together organizations from the front line to the executive suite to the boardroom. As the basic unit of organization, how big is a small group? How big is a group of small groups? Does being virtual make a difference in size? The number of people on a team is one of those things that appears so obvious that it is easy to miss its significance. All teams, after all, have a size that refers to the number of members. Size also accounts for the internal communications burden, and the number and variety of interactions and relationships that the team requires. The size of a co-located team is rather immediately apparent and membership is usually clear. In virtual teams, size often becomes fuzzy as membership swells and contracts when individuals come and go. Virtual membership boundaries often have degrees of “centralness” or “bands of involvement”—a core group, an extended team, and an external network of partners (Figure 8.2). Millions of years of experience indicate there are two natural breakpoints in the size of small groups: Five and 25. Experienced team leaders, researchers, and popular writers alike agree that the ideal core team ranges in size from four to seven members. This is, not so coincidentally perhaps, the same size as a typical Stone Age family and not very different in size from many families today. Is there a lower limit to team size? One debate among researchers is whether two people, technically known as a dyad, are enough to constitute a group? Three people, so some thinking goes, bring enough diversity to qualify: Three “nodes” offer multiple communication pathways and the possibility of sub-groups and cliques. For us personally, this is not a question: Two can team. As friends, lovers, spouses, parents, business partners, and even co-authors together (this is our sixth book), we surely are a very small but very complex group. Even two people can play many roles with one another, with a great diversity of communication (and potential for misunderstanding) between them. Teams do not exist in isolation. For millions of years, teaming occurred in camps and groups of camps (Figure 8.3). This remains true today, even if “the camp” often goes unrecognized. The nomadic family yokes together between four and seven people as its basic socioeconomic unit, the same size as today’s typical team. From time immemorial, these small units naturally have congregated into larger associations. 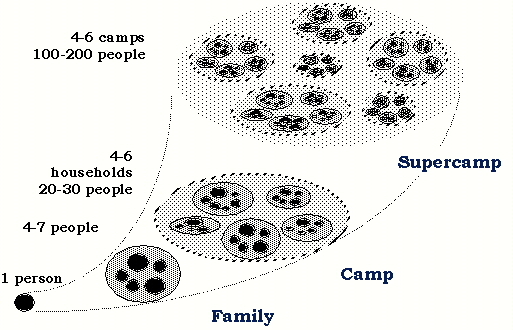 Camps, involving clusters of four to six families, appear to be as universal as the family itself. The Olduvai Gorge in Tanzania, for example, reveals base camps of 25 to 30 people as early as 1.7 million years ago at the very beginning of the Stone Age, the Lower Paleolithic era. Researchers call this “the magic number 25,”23 five camps of five families averaging five members each. Twenty-five is also the number of people in most everyone’s “persisting life-long network.” These are the folks who are closest to you throughout your life, staying with you despite job changes, divorces, births, deaths, and moves from one locale to another. With more than 25 or 30 people, a comfortable meeting becomes difficult and starts to turn into a conference and people cease to be entirely familiar with one another. All of this becomes more murky however when people are online. How many people can maintain a reasonable conversation online? We suspect that, for now, the same number applies to virtual teams. More than 25 people on a core distributed team leads to loss of intimacy required to sustain meaningful communication. These super-camps are comparable to a large group of 100 to 200 people, another natural cleavage point in modern organizations. W.L. Gore & Associates, the folks who brought Gore-Tex to the world, keep their plant size to a maximum of 150 to 200, which founder Wilbert (“Bill”) Gore believed was the number at which human achievement peaks. Larger than that, he said, people start to get in one another’s way. 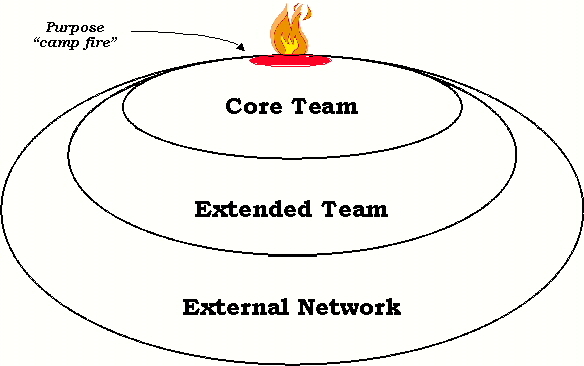 When people call a group that is bigger than a handful or two of people a “team,” they usually are referring to a “team of teams.” This is a group that has a common set of cross-team goals and interdependent tasks—what we call a teamnet, a network of teams.24 Understanding the appropriate internal team structure is an often-overlooked design issue. People sometimes make these often contentious sub-group definition decisions too early, too make-it-or-break-it-confrontationally, or too unconsciously and off-handedly. There is no one “right” size for virtual teams. Size depends first on the task at hand, and second on the unique constraints and opportunities of the situation. Generally, the more complex and diverse the task, the larger and more diverse the team needs to be—more expertise, more people. While more people bring more talent, they also bring along the need for more coordination and that generates its own problems. Adding people helps performance up to a point. Then the law of diminishing returns sets in. Before long more people degrade performance.25 After a limit, which seems to vary by task, more people may actually do less. Sound familiar? Big, big, qualifier: Since these rules around size come from millions of years of experience with co-location, it is only a starting point for estimating the appropriate sizing and clustering for virtual teams. Virtual teams can be successful only if people cooperatively manage and coordinate membership and leadership. With the skills and infrastructures in place to multiply and share leadership, we are seeing some teams explode the apparent limits on productive size. Virtual teams tend to have relatively smaller active core groups and larger overall memberships. With each new level of organization, new team roles and responsibilities emerge. A group with an identity itself becomes an “individual.” The team acts and is perceived as a unit at the next level of organization. Teams that are really humming often become very inwardly focused, sometimes creating bonds that rival family ones in strength. Warning: Virtual team success can breed insularity. Management movements like quality and reengineering created a new myth: The team as hero.26 While this recognizes the renewed importance of small groups, it also can invest the team with rampant, competitive, isolationism. Independent teams without inter-team interdependence can fragment corporate structure. We are in danger of moving from isolated bureaucrats sitting in specialized boxes to isolated teams of disconnected specialists. The team-alone syndrome dominates many businesses as well as other organizations. Individual teams spring up as challenges arise that the existing hierarchy-bureaucracy cannot manage. Generally unconnected to one another, these teams are rarely part of a conscious strategy to grow the organization to meet the challenges of accelerating change. Some companies are already working in 21st-century, virtual team style. For Pfizer, Buckman Labs, and Sun Microsystems, virtual teams are over time a key business strategy. They offer competitive advantage for meeting challenges of speed, cost-effectiveness, and quality in a global, customer-focused, rapidly changing economy. How is this possible? Because the human ability to connect has increased exponentially. 1 Interview with Dr. Henry McKinnell, president and chief executive officer, Pfizer, Inc., January 19, 2000. 3  E-mail from Stewart Brand <www.longnow.com>, “Re: Is this you?” February 27, 2000: “ In fall 1984, at the first Hackers' Conference, I said in one discussion session: "On the one hand information wants to be expensive, because it's so valuable. The right information in the right place just changes your life. On the other hand, information wants to be free, because the cost of getting it out is getting lower and lower all the time. So you have these two fighting against each other." That was printed in a report/transcript from the conference in the May 1985 , *Whole Earth Review*, p. 49.” Brand also mentions this idea in THE MEDIA LAB (Viking-Penguin, 1987), p. 202 . “Since then,” he writes, “I've added nothing to the meme, and it's been living high wide and handsome on its own. I saw in a WIRED, April 97, that Jon Katz opined on p. 186: ‘The single dominant ethic in this [digital] community is that information wants to be free.’"
4 See Reinventing Government: How the Entrepreneurial Spirit Is Trans­forming the Public Sector by David Osborne and Ted Gaebler (New York: Plume/Penguin, 1993). Osborne served as a key contributor to the National Performance Review. 9 Andy Campbell came up with the name in a brainstorming session at the meeting. 10 To obtain a list of National Performance Review materials, send a one-line e-mail message via the Internet to “almanac@esusda.gov” with the following text: “send npr catalog” or send a letter via U.S. mail to National Performance Review, 750 17th Street, NW Washington, DC 20006; telephone: 202-632-0150. 11 In addition to the contacts listed in note 2, NetResults information is available by calling Lisa Kimball at Caucus System, Inc., 703-243-6622. 13 “INS: Integrated Card Production System,” on “It Pioneers: The 21 winners of the Government Technology Leadership Awards forge into the IT frontier,” by Joshua Dean, GovExec.com, December 1999 http://www.govexec.com/features/1299/1299s6.htm. 14 Email from Al Gilman, “Why you want to tell the story of Marion's award,” January 21, 2000. See http://www.w3.org/WAI/PF. 15 “What are we going to do with Marion?” Eulogy by Larry Metcalf at her memorial service, December 17, 1999. 17 E-mail from Jennifer Sutton, “Re: How are you and Al’s e-mail.” January 11, 2000. Sutton read poems at Marion Metcalf’s memorial service. 18 Luther P. Gerlach and Virginia Hine, People, Power, Change: Movements of Social Transformation (New York: Bobbs-Merrill, 1970). 19 Allen W. Johnson and Timothy Earle, The Evolution of Human Societies: From Foraging Group to Agrarian State (Palo Alto, CA: Stanford Uni­versity Press, 1987), p. 52. 20 Lipnack and Stamps, The Age of the Network, p. 84, and The TeamNet Factor, pp. 47-49. 21 Glenn M. Parker, Team Players and Teamwork: The New Competitive Business Strategy (San Francisco: Jossey-Bass, 1991), p. 53. 22 See Knights of the E roundtable, credit Kastner book. 23 Johnson and Earle, The Evolution of Human Societies, p. 320. 24 Lipnack and Stamps, The TeamNet Factor, p. 13. 25 Research has repeatedly demonstrated the inverted “U”—shaped relation­ship between size and performance. Paul S. Goodman and Associates, De­signing Effective Work Groups (San Francisco: Jossey-Bass, 1986), p. 16. 26 Robert Reich, “Entrepreneurship Reconsidered: The Team as Hero,” Har­vard Business Review (May-June 1987).